I had heard somewhere that prophets weave the tapestry of the future, or something like that. So I made this strip based off of that concept. Kind of stupid, right? Well, I think my mom will like it! At the beginning of the strip the Cat is curious to what the Mouse is doing. Because he likes to think he can figure things out on his own, he hops off the wall for a closer inspection. The Cat has a bit of trouble getting back on the wall, because he is very unfit. I know it doesn't really register, but you have to admit, it is pretty amusing to watch him struggle! Also it eats up some time, so the strip fills out the minute nicely. I hope everyone is enjoying their Monday off! See you next week! This strip was written by the young and talented Josh Lieberman. He's a pretty big fan of the show and a good friend of mine. 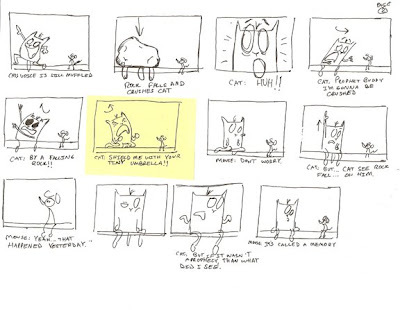 I met up with Josh a few months back and he had brought me a storyboard he had drawn up for an episode of Prophet Buddy. The board was very detailed, well-drawn, and very funny, therefore I couldn't use it as an episode. 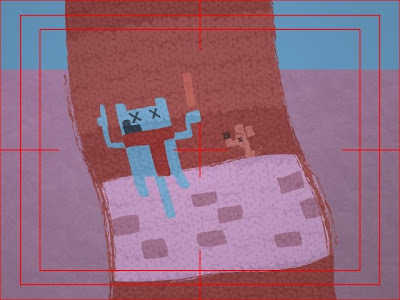 Prophet Buddy episodes are not suppose to be detailed, well drawn, and funny, it's part of the series's charm. Josh had also pitched me the math homework story which he had not boarded or thoughtout all the way through, which was perfect. I instantly visualized it in my head as something that could be told under a minute with my mediocre drawings. So go to the Prophet Buddy site now and watch it in all of its glory! Thanks Josh, I hope you and everyone else likes it, if not... YOU'RE FIRED! Hey everybody! 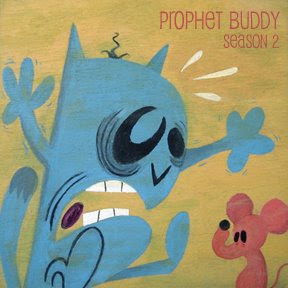 Here it is, Prophet Buddy season 2! 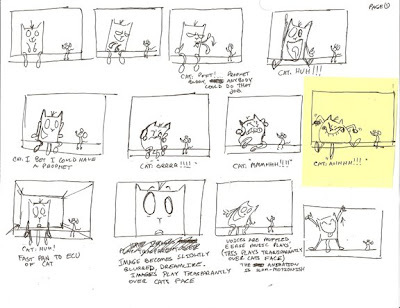 In the next several months you will be seeing the Cat and Mouse in 13 brand new forseeing funnies. Hopefully you will notice a slight increase in quality, the powers-that-be have extended my schedule and have allowed me to spend two days extra for each strip! To commemorate the coming of the 2nd season, I've busted out my brushes and painted a little something for the iTunes album art. I think the strip is actually funnier without this extra bit, though it was very painful for me to cut. 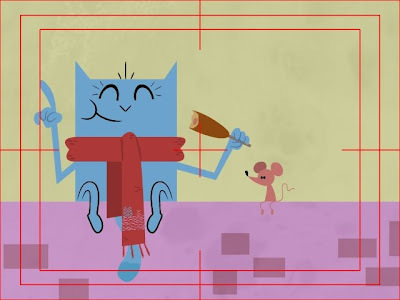 An animated internet comic kinda like Tom & Jerry, if they were best friends, didn’t chase each other, were designed differently, and if Jerry was a prophet. Actually it’s nothing like Tom & Jerry. Buy a Prophet Buddy Shirt!